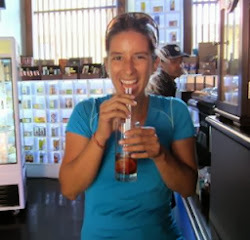 Drea's Food Adventures: The World's Healthiest "Carb"? A Close Look at Injera, the national food of Ethiopia. "Injera for breakfast, injera for lunch, injera for dinner. All the time, injera. Always." -- Our Ethiopian home stay host's description of his diet. How to describe injera? it's a spongey, crepe-like pancake that tasks like sourdough and is served in rolls and almost as a serving platter. Different kinds of stews/curries are then served on top of the injera. Except for chicken (which is usually served on the bone), most of these stews/curries are all bite sized and are scooped up with a piece of injera. Everything is eaten with your hand, there are no utensils. Injera is made from a very unique grain called teff. Teff originates from Ethiopia and most Ethiopians with whom I spoke said teff only grows in Ethiopia. According to some locals, teff is also extremely healthy and has a high iron content (being prone to anemia, I ate a lot more injera after discovering this useful fact). Based on basic research, teff is indeed a very healthy grain and as a huge plus, it is gluten-free. It also has plenty of Lysine, an essential amino acid that increases calcium absorption and helps lower bad cholesterol levels. Its fiber, calcium, potassium and protein contents are excellent. Apparently, one cup of cooked teff has 40% of the recommended daily intake of calcium! This tiny little grain is ground into a flour which is then used to make injera. I was so curious about Ethiopian cuisine so, I just had to take a cooking class. Injera was by far the easiest thing to make. First, you need the batter. The batter is simply water, yeast and teff flour mixed together and left to sit for three days (which is probably what gives injera its sourdough taste). Once the batter is done, lightly grease the largest pan you have, heat it up and then pour some of the batter so it covers the entire surface of the pan on a medium-high heat. The batter will immediately bubble, giving the injera its spongey texture. Cook the injera, covered, for two minutes. Only one side is cooked, so once the two minutes are up, it's done. Peel it off the pan and it's ready to eat. Ethiopians have humongous and specialized injera makers, but for the non-Ethiopian, this 'pan method' works just fine. 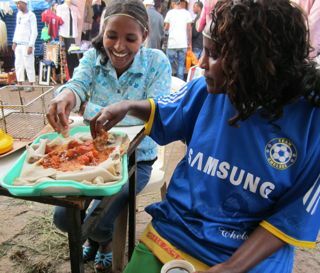 Ethiopians are devout fans of injera and they will eat it every day. Similar to Dal Bhat in Nepal, this is a staple food throughout the country and even when teff is not available, people will make injera with other grains such as wheat or barley. 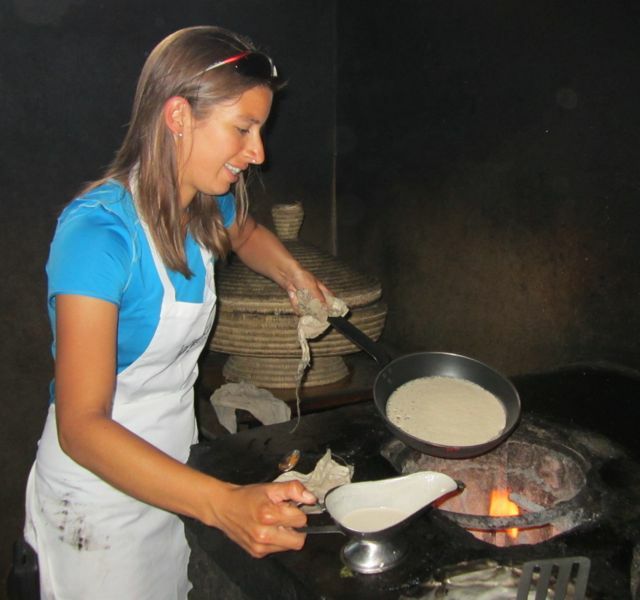 For example, our typical Ethiopian diet consisted of injera in the morning with tibbs (small pieces of meet in a spicy garlic stew) and plain egg omelets. Coffee beans would be roasting as we ate and we would wash down breakfast with a nice simi (cup) of fresh, delicious, border-line orgasmic home-made Ethiopian bunna (coffee). 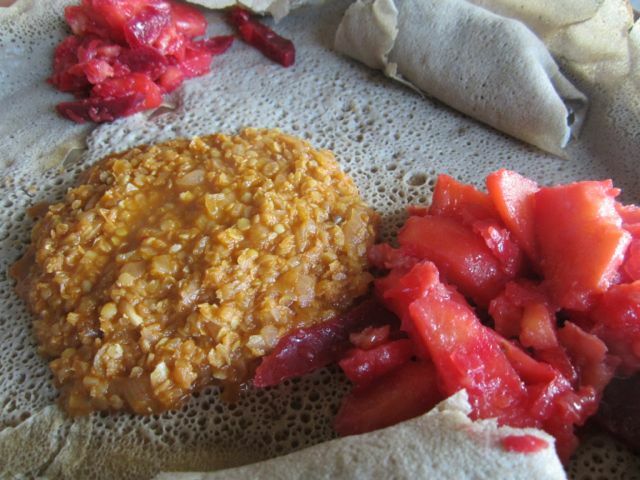 If it wasn't a wednesday or a friday, lunch would consist of injera once again with either more tibbs or meat wot, which is a special dish made with bean flour. Again, we'd wash down our lunch with another freshdeliciousborderlineorgasmichomemadeEthiopian bunna! And what's for dinner? You guessed it! Injera of course with some more stews. This time, however, we'd wash down dinner with a nice glass full of dtala or tejj -- Ethiopian home-made beer or honey wine. As far as carbs go, injera does seem to be a very healthy alternative - especially when it is made with teff flour. But, could I mirror our host's diet? Thanks for sharing. I learned a lot from this post. I love Injera. I already know what to do when reading this article. Thank you. I think it is healthy to eat injera daily since it prevents the dependence on other unhealthy foods. 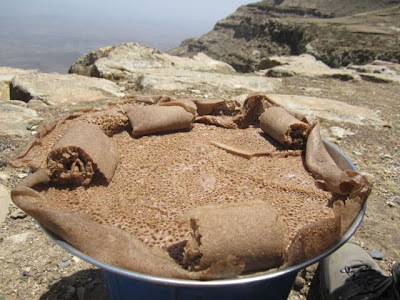 Injera contains no oil, has fiver and vitamins, and the fermentation makes it digestible. Traditional cultures have staple foods which we americans are not accustomed to since we have an anything goes mentality and everyone is eating something different, everyday. Thanks Anonymous! It *is* a wonderful food to eat and I love the fact that it is fermented. I enjoy eating traditional foods from various cultures and injera is one of the most unique ones I've tried. Oh my goodness this looks amazing! I love avocados in anything so I think this is a MUST Try! I freaking love that Misr Wat picture. Goddamn right ! Thank you for sharing! So glad I found this blog! I love Injera, I'd eat it three times a day and even in between meals. I want to marry an Ethiopian woman someday. I live in Oregon and I cook Ingera at home sometimes. I used to eat it everyday in Ethiopia. I just ate lentil stew and cabbage with it. Thanks for the info. I Love ingera.